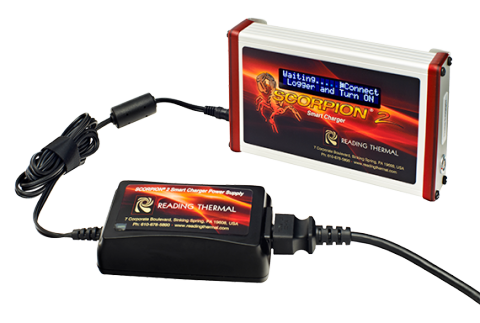 The SCORPION®2 Smart Charger is used to charge the SCORPION® 2 Data Logger Battery. 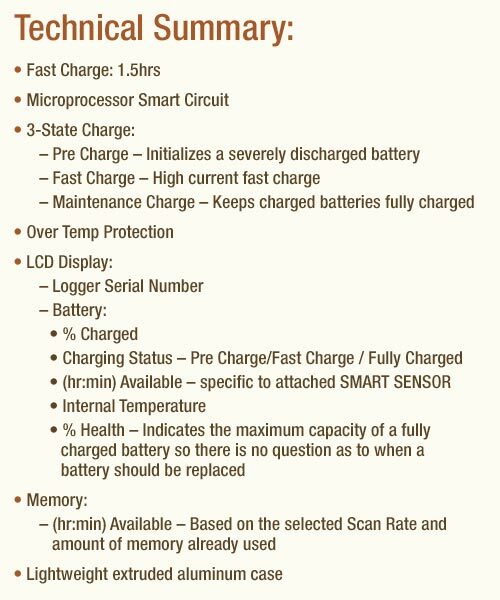 It also acts as a user interface displaying vital information about Memory Available (hr:min), Battery Available (hr:min), Battery Internal Temperature and Battery Health. A microprocessor controlled smart circuit is used to analyze the battery capacity and temperature to determine the correct charging current required to bring the battery to full capacity as fast as possible. The smart circuit can bring a severely discharged battery to full capacity in 1.5 hours. It also provides over temperature protection by monitoring the internal battery temperature and suspending charging for 30 minutes if the maximum threshold temperature is reached.